Pinus Pinea is also known as the Italian Stone Pine or Umbrella Pine, however most commonly as the Pine Nut Tree. This is the tree from which we get the pine nuts used in cooking. Without it Pesto and many other recipes would simply not be what they are today. A very interesting tree that naturally grows to form a spreading slightly domed but almost ‘flat top’. 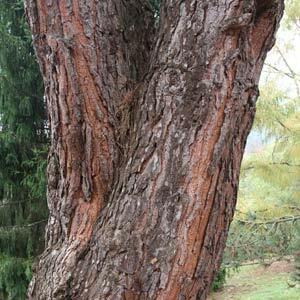 Pinus pinea are grown commercially for the edible pine nuts, especially in Italy and Portugal. Over time the tree forms a trunk with fissured bark, in itself a feature. A few grafted varieties are becoming available, the advantage being that they are said to produce nuts slightly earlier. Tolerant of coastal conditions Pinus Pinea are fairly drought tolerant once established. Generally container grown as they process a tap root which needs to be left undisturbed. Pinus Pinea are also useful as a shade tree where lower branches are pruned away. With a good clear trunk Pinus pinea is suited as a street tree and for avenue planting. Position – Full sun well drained soil.